Situated in the coastal area of Seignosse, Les Oyats is a perfect getaway for families and couples looking for a seaside retreat. Surrounded by pine forests with well-maintained pitches, this luxury camping site is ideal for mobile home users and campers alike, with sandy beaches under 15 minutes-walk away. 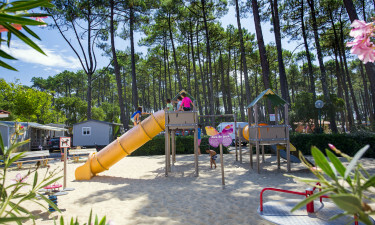 Located in the heart of a traditional Landais village, Les Oyats offers a tranquil camping holiday with its forest, pond and beach access. With on-site necessities to cover your needs, visitors can choose to relish in the copious facilities or explore the neighbouring region of Basque. Book now with Luxcamp. Les Oyats’ pool area consists of a 7,500 sq. ft heated pool complex with winding water slides, fun paddling zones featuring canons and fountains, and a bubbling Jacuzzi area. The well-maintained poolside solarium is ideal for soaking up the Landes sunshine. 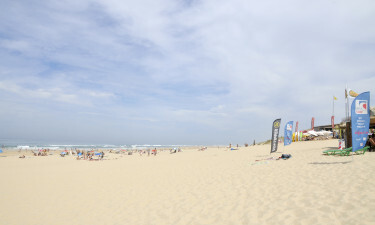 You'll find many stunning sandy beaches in the area, all accessible under 15 minutes by foot. This stunning coastal area of Seignosse features some 5 sandy beaches and coastal habitats across a long 3.6 mile stretch of land, easily accessible via foot or bicycle.